Guildford is a rural township 10 km south of Castlemaine, on the Loddon River, the Midland Highway and near the railway line (1874) from Castlemaine to Maryborough. It is 100 km north-west of Melbourne. The name was probably inspired by the ancient town of Guildford in Surrey, England (geltford meant a crossing where a toll was paid). The area’s early settler-pastoralist, John Hepburn, crossed the river by a ford near the present township. A short way east of Guildford several streams enter the Loddon River and they carry alluvium which has been deposited along the Loddon valley. Intensive farming was carried out in the valley. 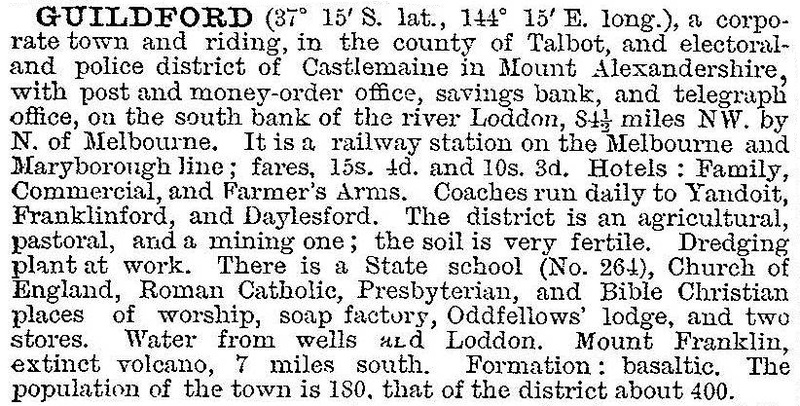 Guildford borough was created in November 1866, later being absorbed by Mount Alexander shire (1871). It took over from Fryerstown as the administrative centre of the shire from about 1911 until 1915. A number of Guildford’s brick and stone buildings have survived, as the township’s viability was preserved by there being adequate farmland to maintain a population when mining declined. In addition to the Anglican church (1861) there are Delmenico’s hotel, music hall and stables (1856), and the school (1868) which are on the Victorian Heritage Register. The Catholic and Wesleyan church buildings have been sold. There are also very large specimens of Eucalyptus rostrata (river gum), the Tara and Hilltop Cottage rose gardens and a lookout on the Guildford Plateau off the Midland Highway, overlooking the township. Civic and public facilities include a primary school (16 pupils, 2014), a public hall, a hotel, a sporting reserve and a general store. The main street has an avenue of honour (1919). Mine tailings are north-east of the town.